Sanguli - Book your camping vacation to Costa Dorada in Spain now. 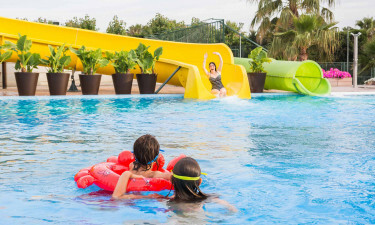 With its fabulous palm-fringed pools, amazing Roman-style amphitheatre, superb facilities and stunning location, this magnificent luxury camping site on the Costa Dorada is perfect for the whole family. Come and discover the magic for yourselves! Why come to Camping Sanguli? The grey skies of home will be a distant memory as you float in the Relax Pool, with its enchanted tree and cascading waterfall. 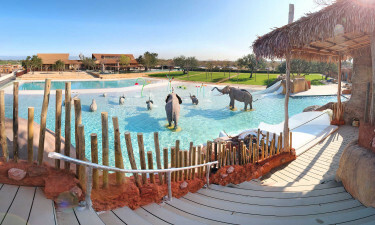 For a rush of adrenaline, try the Happy Pool with its water slides and for the full luxury camping treatment there’s the Fiesta Pool with a Bar Oasis, so you can sip on a long drink without leaving the water! All pools have safe shallow areas for toddlers and terraces for relaxing in the sun after a swim. 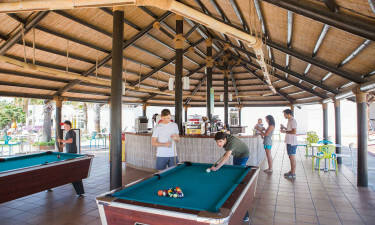 Beach volleyball, football, basketball and ping-pong, plus a gym, tennis, mini-golf and trampolines are ideal for both keeping healthy and socialising with friends both old and new. In the evening, the amphitheatre becomes the focal point of Sanguli. A replica of the famous ancient amphitheatres of the Roman Empire, it serves as a dance floor in the early evening, where the whole family can let their hair down and show off their moves. As night falls, it becomes an enchanting place to dine or have cocktails whilst enjoying the spectacle of the evening show. The blue flag beaches of Llevant and Ponent boast gorgeous expanses of golden sand and a sparkling, turquoise sea. The shallow waters of Ponent are especially great for small children. To the west, Cap Salou has 3 picturesque coves that are ideal for swimming and snorkelling. Teenagers can try a variety of water-sports, whilst kids will love the excitement of the PortAventura theme park. 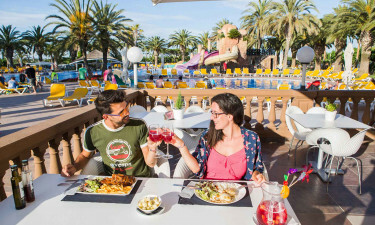 Salou has a vibrant nightlife, but for a more relaxed evening try one of the superb seafood restaurants in the lovely fishing town of Cambrils. The medieval port city of Tarragona with its ancient Roman ruins is another must-see destination. Located beside the Relax Pool, the Sanguli Restaurant serves a delicious array of international dishes and has a special menu for children. Dine on the terrace to the sounds of the waterfall for an unforgettable al fresco meal. Two conveniently located takeaways and 3 bars ensure you are never far from a snack or refreshments! Start the day by visiting the bakery for warm, freshly baked bread and pastries. The large supermarket caters to all your shopping needs and at the gift shop you will find newspapers, beach items, souvenirs and many other useful holiday items.